Welcome to the 16th edition of the Paris International Feminist and Lesbian Film Festival "Quand les lesbiennes se font du cinéma". The Cineffable team is really happy to see you again for its festival. A festival marked by recognition. Recognition From The Art And Cultural Circles Since its creation, the festival has been aiming at being a place of discovery and promotion of feminine and lesbian Art. In gathering every year films and pictorial and photographic works made by talented women, and in offering a stage to musical bands and performers, Cineffable chose to celebrate in its own way the vitality, the quality, the wealth and the specificity of the feminine and lesbian Art. And the artists are well aware. More and more directors and artists from all over the world now contact us directly to have us promote their works. Several organizations and associations, in France and abroad, look for our advice and experience to help them with the creation and programmation of other feminist and lesbian cultural events. Within several years, the Paris International Feminist and Lesbian Film Festival "Quand les lesbiennes se font du cinéma" organized by Cineffable has become one of the major lesbian cultural events in Europe and we wish that it will keep on growing over and over. Besides the recognition from the audience and the art circles, Cineffable is pleased to have seen its cultural role officially recognized by the City House of Paris with the granting of a subvention. We hereby would like to thank all the members of the Conseil Municipal who have supported our request. But most of all, we want to thank you, our audience, for your militant support and presence at the festival and during the "Best of Mixte" which has shown very valuable for the obtaining of a recognition from the public authorities. Therefore, in order to show you our gratitude, we have decide to use part of the subvention to lower the screening ticket prices. We thus wish that you will fully enjoy, use and abuse of this new edition of the festival, and that most of all, you will keep on attending the festival with joy and happiness as this event is a place of discovery, get together and exchanges dedicated to you. 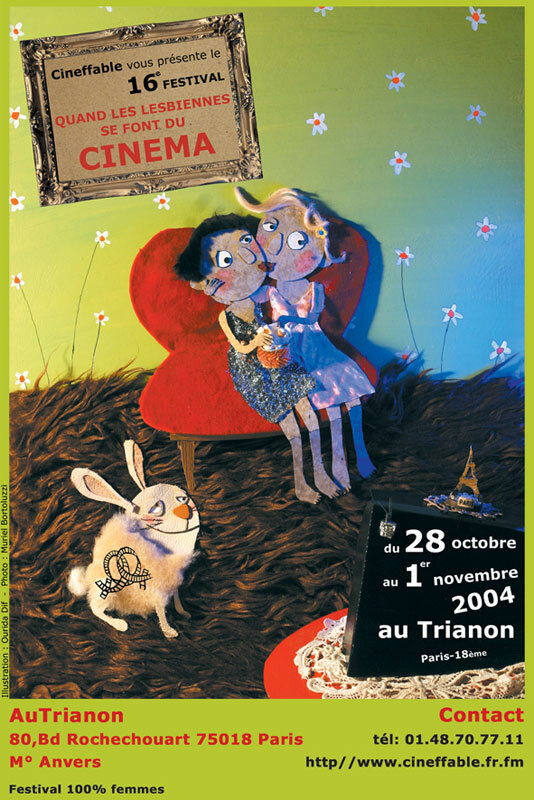 The 16th Festival "Paris International Feminist and Lesbian Film Festival" will see us back at the Trianon and the Halle Saint Pierre, from the 28 Octobre through the 1st November 2004. Here is the list of films and hours (25th oct). If you want to help make the coming festival an even bigger success, come and join us: get in touch with the volunteer group! 6.00 pm: Opening night concert: "Les Fées Minées" at 7.00 pm, and films at 8.30 pm. 8 pm: a selection of our best films this year, as a closing night treat. The festival party this year is at the “la LOCO” on Friday 29th October from 11 pm to dawn. And a short time after the festival, there is a Tea Dance at the Tango (13 rue au Maire, M° Arts et Métiers, price 5 euros) on Sunday 21 November, from 5 to 10 PM.